When artists break boundaries of traditional forms and work outside of institutionalized systems, they often must create new infrastructures to sustain their practices. 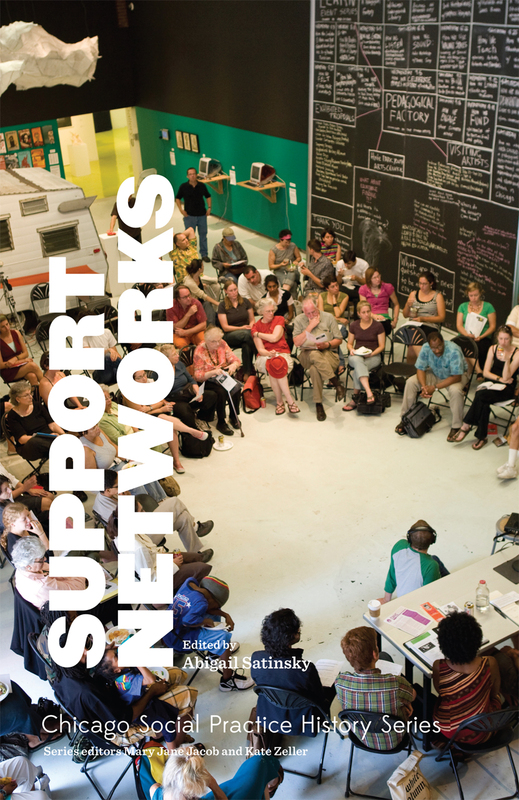 Support Networks looks to Chicago’s deeply layered history of artists, scholars, and creative practitioners coming together to create, share, and maintain these alternative networks of exchange and collaboration. The contributors to this collection explore how the city continues to inform and shape contemporary cultural work and the development of informal organizations. Many of the authors are contributors to the scene themselves, having envisioned, founded, and activated these new ways of working. The unconventional systems explored in Support Networks call attention to stories and experiences often overlooked in this history. Ranging from artists’ reflections to essays, interviews, and ephemera, these perspectives challenge existing narratives and foreground underrepresented voices. Through more than twenty-five diverse examples of community building, activism, and catalytic projects, readers will find the inspiration they need to build their own counter-institutions. Support Networks is part of the new Chicago Social Practice History series, edited by Mary Jane Jacob and Kate Zeller in the Department of Exhibitions and Exhibition Studies at the School of the Art Institute of Chicago (SAIC). "An ambitious and intense series. . . However we define our relationship to art, social practice discovers meaningful alternatives to the dominant notions of what is possible in life."